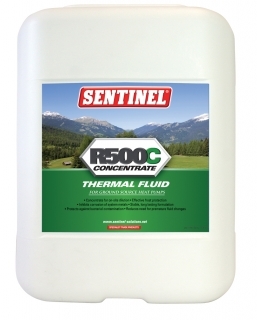 Sentinel R500C Concentrated Ground Source Heat Transfer Fluid allows for exceptional thermal transfer and protection for Ground Source Heat Pump Systems and is available for purchase at PlumbNation. 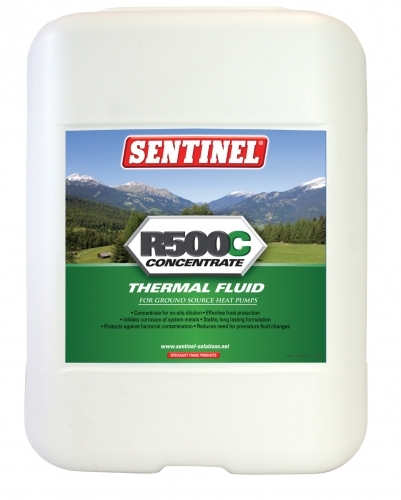 Sentinel R500C is a clear dark blue concentrated glycol-based liquid designed for on-site dilution. It is a highly efficient thermal transfer fluid for use in Ground Source Heat Pump equipment and ground loop circuits. Optimised to provide frost protection, it offers superior stability, exceptional thermal transfer, protection against corrosion and deposits. It also contains an effective biocide that will help to control the growth of bacteria in a sanitised system should it become contaminated after commissioning so providing extended fluid life. The properties of Sentinel R500C help reduce the costs of system operation. We at PlumbNation recommend the FrostCheck Test Kit for installation validation checks.